I’m not going to pretend that I knew Walter Young. I never met him. However, from the people I talked with and heard from that did know him, I wish I had. Simply put, Young was described as a giant of a man with an even bigger heart. I did get to see Young play at the end of the 2002 season. I was in Hickory preparing to move my family here from Columbus, GA. I saw the big powerful man – listed in 2002 at 6-foot-5, 258 pounds – approach the plate and saw the numbers that went with it. From what little I knew about the Crawdads at the time, I knew that this was the powerhouse in the lineup that likely had a lot to do with the Hickory Crawdads making the playoffs – a run that ended with the Crawdads first South Atlantic League (SAL) title. 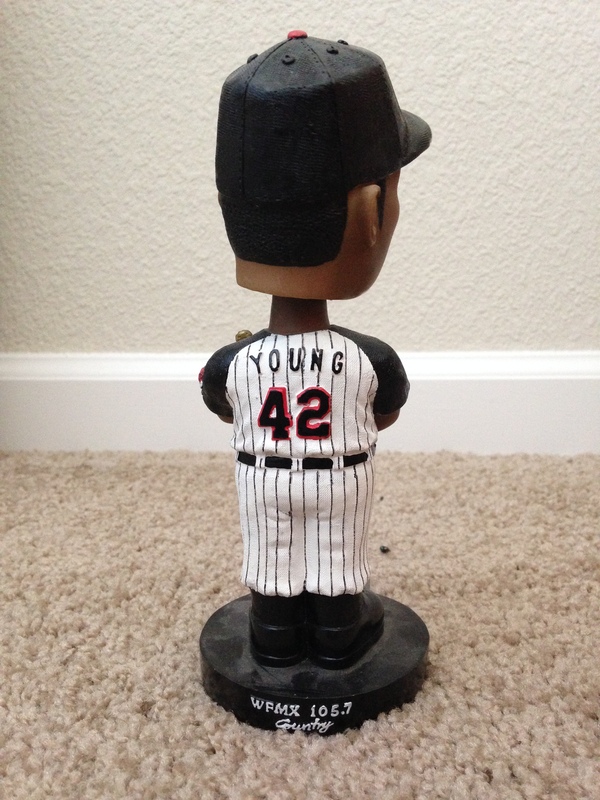 What I do remember about seeing Young play in 2002 – oddly enough – was the intentional walk. It was in such a situation that I taught my then eight-year-old son about intentional walks, and it happened simply because the other team didn’t want to get beat by the big man. Young was certainly feared by SAL pitchers in 2002. At a level where intentional walks are rarely issued, Young received six that season – more than the Crawdads team has received in six entire individual seasons since 2008. The numbers Young put up that season were among the best ever by a Crawdads hitter. His 34 doubles were a single-season record until 2011. He led the SAL that season in doubles, home runs (25), hits (164) and total bases (277). 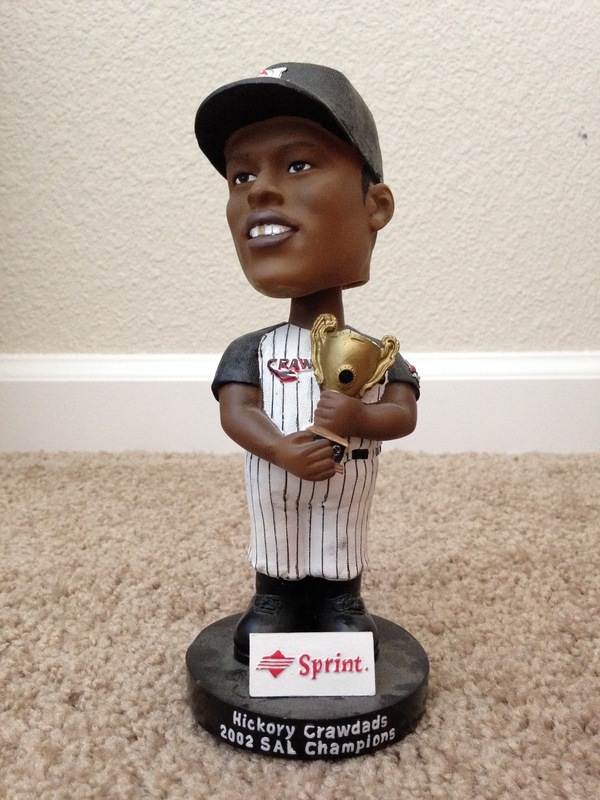 For his efforts, Young received the league’s Most Valuable Player award. His power was certainly legendary among players in the Pittsburgh Pirates organization. While the tales of his Paul Bunyan-type power were recalled by players and fans alike, they paled in comparison to stories of Young the person – a man who enjoyed what he did on and off the field, often with lots of laughter. He was described by several players as a mentor who took them, in some cases, literally under his care. The combination of power and personality of the man were such that the Crawdads held a Walter Young Bobblehead Night the next season. He’s the only Crawdads player I can recall that had a bobblehead night the following season after playing with Hickory. The friendships that Young made were not just for the moment, but in many cases turned into lifelong friendships. 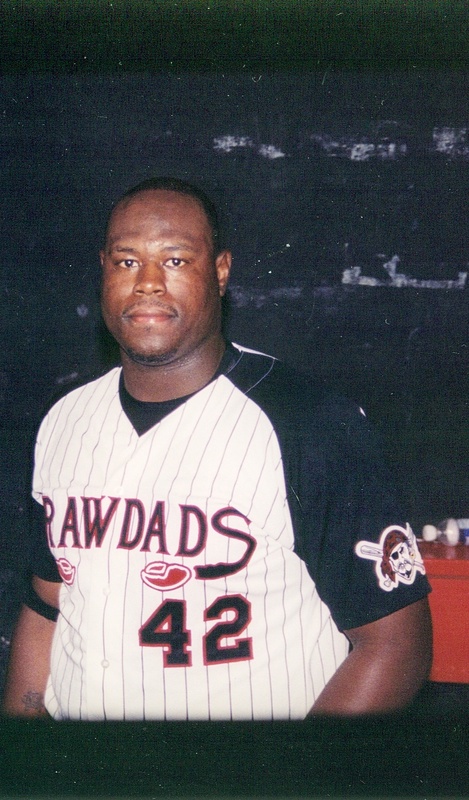 Former teammate Vic Buttler (’01-’02, ’05) told of his first meeting with Young at the Pirates complex in Bradenton, Fla.
Young was certainly revered by fans and the Crawdads front office staff that got to see Walter Young play. When I began working with the team’s front office in 2005, occasionally you’d here talk of “Big Walter” with big smiles and occasional laughter. It was simply a reflection of what they had received from Young himself. “Walter Young always had a big smile and was very kind to everyone that he met,” recalled former long-time Crawdads employee Barbara Beatty. 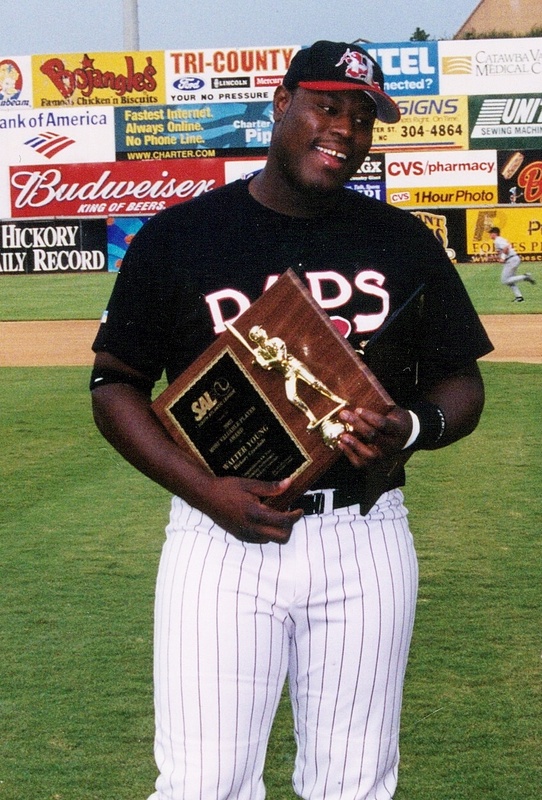 When Young received what turned out to be his lone major league call-up in September 2005, those who knew him were genuinely glad to see Big Walter get his chance with the Baltimore Orioles. Perhaps the best story from those who worked for the Crawdads comes from former Crawdads bat boy, Eric Davidson, who celebrated his 18th birthday on the night the Crawdads won the decisive game five of the SAL Championship Series at L.P. Frans Stadium in Hickory. Young played through the 2009 season before returning home to his native Purvis, MS, where he worked as a deputy sheriff. 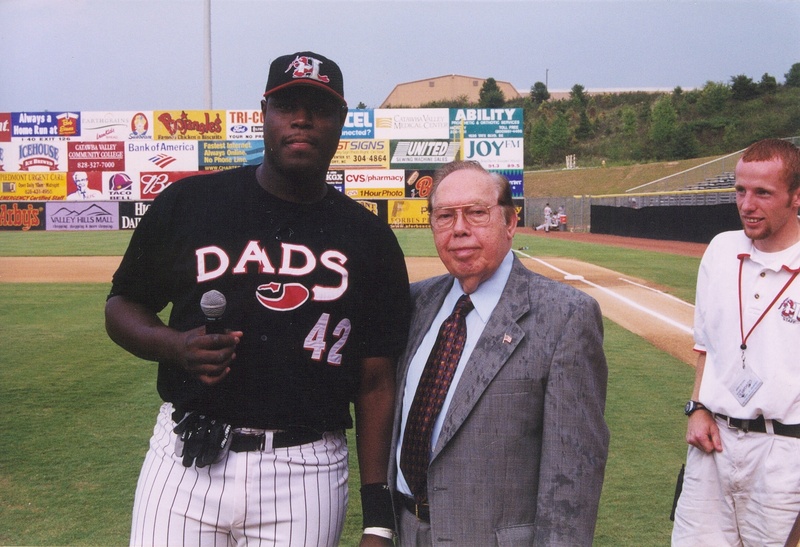 Former Crawdads on-field emcee Jeremy Neisser added a few memories of Walter Young’s 2002 season. #1 – Before the start of the season the Hickory Daily Record put together a piece on the Crawdads. They asked if we knew what Walter looked like since him and Chris Young had the same last name. They wanted to do a piece on the “Youngs” but we had no clue anything about Walter. #2. Walters walkout song was “It’s getting Hot in Here” by Nelly. #3. Mike Maulding at Peak Motors down the street got Walter to sign a bat for him, I remember him and Walter chatting after the championship game about how much fun the season was and how Walter was a man playing with boys during the year. Walter literally lead almost every offensive category that year. #4 Walter made the 2002 SAL All-Star team with Keppinger, Vic Buttler, Jeremy Harts, Chris Shelton and Manager Tony Beasley. I believe Bautista was too. Walter was named the Most Outstanding Prospect and MVP of the game. That same year Robinson Cano, Angel Pagan, David Wright and Ryan Howard all made the All-Star team with the Crawdads boys. #5 Our last series before the All-Star game we were playing in Hagerstown. I was on the road doing radio with Canio. Before we left the plan was for me to drive our All-Stars to Lakewood from Hagerstown. We rented a van from enterprise and I drove Walter Young, (Jeff) Keppinger and (Jeremy) Harts while Chris Young drove (Chris) Shelton. It was a fun and interesting ride from Hagerstown as Harts and Keppinger and Walter just shot the breeze about the season and the goal to win the championship. It was like being that fan who had the chance to sit in the clubhouse and shoot the breeze about the game and the season. Walter was never an outgoing guy so that was a special moment. #6 Walter lived with Harts across from our Brad and I inside Northside Apt. We routinely picked up these guys for player appearances and all these guys wanted to do was sleep. Can’t blame them, I would too. #7 Chris Shelton and Walter routinely switched back and forth between who was DH and 1B, Beasley had a pretty easy job putting together that lineup. I can still remember it like it was yesterday, Shelton caught the foul pop-out to end the Championship game and we all celebrated like we were world champs! After the celebration on the field ended the team and staff headed to the clubhouse. Champagne was getting popped and beers were getting poured on peoples’ heads. It was a fun celebration. I vaguely remember Walter not participating. He was hanging up his jersey, cleats, etc while everything was happening. Not sure why he didn’t.. maybe he knew this was going to happen all along. RIP JuneBug! You’ll be missed but never forgotten! I have known this man since he was playing Dixie Youth Baseball. He was always considerate of everyone else. If you knew his dad, Walter Young Sr. and mom, Juanita Young, you’d understand. This is truly one if the nicest families I know. I remember Purvis High School playing against Perry County High one night. They were trying to pitch Jr. Walt inside…..big mistake. He pulled the fast ball into the 1st base cement dugout. It looked like hornets leaving a nest! And you couldn’t blame them. That ball ricocheted around in there for what seemed like 5 minutes. The next time he came up to bat, it emptied before the first pitched. A different game while playing at home he hit a home run between Old Glory and the flag pole in center field…..the ball was still on the rise as it passed through. I don’t remember if that ball was ever found but I doubt it. But to know Jr. Walt, you need to know his life after he played. I don’t think there’s a single player coming through the Dixie Youth League in Purvis that he didn’t have a positive effect on. He pitched for the coach pitch team his son played on. This man had the biggest heart. He never yelled or screamed at players, fans or umpires. I can still see him putting that big arm around the kids that struck out. He loved each and every child playing. And let’s not forget that he was also security at Purvis Lower Elementary. Always smiling and laughing with the kids. I picked up my grand daughter one day and asked her about “the security guard”. Her answer, “He’s big! And he’s nice!” with the biggest smile on her face. No better way to describe Jr. Walt than my 6yr old did. Enough said. Jr. Walt, you will be forever missed. RIP Sir! Thanks for adding the story! Awesome!